So yesterday around 2pm, Heather walked into my office and said "Let's be done with this. What's for dinner?" Well, who am I to argue? So we had food last night! I made the stuffed Brussels sprouts I posted about yesterday. They were pretty darn good. I have confirmed though that I do not like thyme. It is too overpowering for me. I also confirmed using greek yogurt instead of ricotta works just fine. I also baked my chicken breasts, smothered in greek yogurt and dijon mustard. Yum. My total weight loss from juicing for 7 days was 9 pounds. Or right around 9. Um...I will take that. The last couple of days the scale hasn't moved much, and that is okay. For the first time today, I calculated the calories in my breakfast juice this morning, and my lunch juice this afternoon. That is about 400 calories as well. We are going to continue juicing for two of our meals until Sunday....dinner is a healthy choice. Tonight's dinner is crustless quiche and the broccoli recipe from yesterday. and I fell victim to processed food. Good news is, it didn't lead to a crazy binge and I don't want them anymore. I can't be perfect now can I? How boring would that be? I would say that my only complaint from juicing is that during my workouts, I had no energy. Now, I dont know if that's from not having meat based protein or carbs other than in the fruits and veggies, OR maybe it's from not having creatine before workouts...but it was brutal some days. Other than that, I never felt headachey, never felt lethargic, never experienced caffeine withdrawals. I haven't had to fight off the urge to drink a beer or a soda. Last night I felt focused and "re-booted" when grocery shopping. I made healthier choices, looked at labels for number of ingredients or ingredients a 5 year old couldnt pronounce, and bought organic where I could. I think the juicing has done what Heather and I hoped for. Now let's make it stick! Today begins day 7 of our juicing "re-boot"...and it looks like this will be the last full day of juicing. I know...you are sad. Starting tomorrow, we will continue to juice for breakfast and lunch, but then get to eat a healthy meal for dinner. If you remember from months back, I cooked, and subsequently ate, brussel sprouts for the first time. You shared your favorite ways to prepare them, I ignored most of them because they sounded healthy and scared me, and I ended up getting the littlest ones I could find, sauteing onions and garlic, then throwing in the sprouts with a little more EVOO, and then pouring in some chicken broth and boiling them for about 7 minutes. However, tomorrow night I am going to try the recipe for stuffed sprouts above. You can find it on my Pinterest, or from the original "creator" at ﻿http://cookingstoned.tv/ . I found him on Pinterest and he makes cute little videos for those of us who are visual learners. I am going to sub the ricotta cheese with greek yogurt..because I THINK I can, and it would make it a little healthier. **I have shared this before, but it makes a world of difference in my chicken breast. Heather and I both prefer thin chicken breasts. Sometimes there is nothing worse (okay, maybe juicing a bell pepper...trust me...never do it, or getting a poo stuck), but other than that, sometimes there is nothing worse than having to eat a really thick chicken breast that someone has cooked for you that has absolutely no flavor on the inside and is dry and yuck yuck. So, I take one chicken breast, put it on my cutting board, cover it with plastic wrap and pound the hell out of it with my meat pounder (technical term). This makes it thinner, but it also makes one chicken breast serve 2 people! I then marinate it, preferably all day if I have the time, and then grill it. And here is a chicken grilling tip for those of us lucky enough to get to "woman" the grill...You heat your grill on high. Throw your breast on and let it kiss each side for about 1 minute...then turn that sucker DOWN! Low heat is the best way to grill a chicken breast. Don't over cook that sucker. So that is Thursday night dinner. 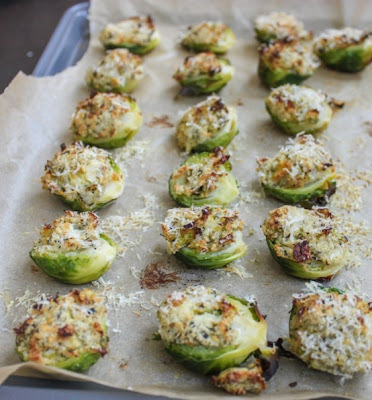 For Friday night dinner, we will be having crustless quiche that is also on my Pinterest board and these little guys below. 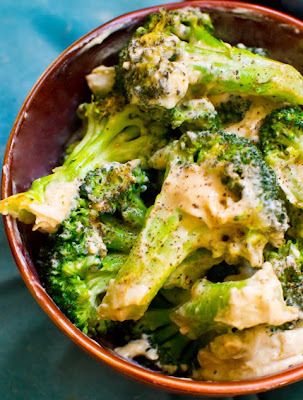 Broccoli tossed in hummus. I steam my broc for about 8 minutes (I like it soft) but the recipe says you can prep your broccoli anyway you want, and then toss in hummus. Interesting. Very interesting. Yey! Another juicing post! Just keeping you updated. Below is a picture of our Peach Pie recipe, which I got from Fatsickandnearlydead.com. I just wanted you to see how much pulp/juice is rendered from 3 sweet potatoes (peeled), 2 granny smith apples (cored), and 4 peaches (de-pitted). For those of you who have gone through a liquid stage of preop, you know of what I speak. The dream where you find yourself eating the most delicious crappy food ever, and get that impending feeling of doom that your liver will be fatty and you are ruining everything...but the food is so good you just don't care? Heather and Travis and I are at the buffet. We go through the line. We get some food. They eat all their food and say "Man, I am still hungry". I say "uh...it's a buffet...you can go back as many times as you need". They say "Waaaaaaat?" AND THEN THE DAMN DOG WAKES ME UP WITH HER SNORING! UGH! Heather and I this weekend. Mmmmmm....juice. Let us be full of ourselves momentarily...you know...MORE so than normal. We spend great amounts of time here in the weight loss community...okay hell...in the world...talking about what we DON'T like about ourselves or what we want to change. So I thought I would make a list, and challenge you to do the same. You can do it on your blog (if you have one), or in the comments here if you don't. You don't have to have a minimum number or a maximum number of things you love (although some of us do suffer from a multitude of attention disorders, so keep that in mind), and your list can be shallow or deep. This is a list of what you love about YOU...not what you love about your life. I make people laugh and smile. People come to my office just to sit and visit, to destress or share. I wear my heart on my sleeve. I still care about making my mom happy (I mean...I didn't say I was GOOD at it). I am a good talker. I love with all I've got. I am a good present giver. The curve of my hips. The area of my body right below my bra line, to which we will refer to as: the skinny zone. My ability to write in a way people want to read. I want a buffet of food right now. Okay, that last one had nothing to do with what I love about me...it just had to be said. It's funny. It was hard to make that list! I ran out of things to say I loved after about 6 things...is that sad? I rallied though! Ooooh, it sounds so fantastic to say day FIVE of juicing. I am trying to convince Heather that perhaps the original plan of a 7-day fast will suffice, versus her initial idea to fast for 10 days...so I will let you know how that turns out...but I am half way through day 5 and it really hasn't been as hard as I thought it would be. Today was weigh-in day for me. Monday's have always been my day. Last Tuesday (we were out of town on Monday), I weighed 186.6. Today I weighed 179.0 (I will change my ticker asap). So in 6 days, 4 of those juicing, I have lost 7.6 pounds. Seeing the 170's again is SO nice. I probably haven't seen anything in the 170's for 6 months or so. I need to check my log. I am looking forward to seeing 177 and getting past that, because for the longest time I hovered around 177. When I initially reached my goal of 170, and then went a little lower...my regain usually came in 3 pound sets. I would gain 3 pounds or so...and hover there for a month or two. Then I would gain 3 more pounds, and hover there for a month or so. That's how it happens. When you are up "just 3 pounds", it doesn't sound that bad. Until that "up 3 pounds" weight becomes your new normal. And then you put on another 3 pounds...and before you know it, you have gained 20 pounds. My goal this time around is to hit 165 and remain there...in the 160's. I want to hit 165 by May 18th. And to do that, (I just rolled my eyes...at my own self...)I am going to have to do better in prepping my meals and making meals for us at home. Yes...I love broccoli now (steamed). And sometimes I try other veggies (besides the bad "Workman veggies if you will: canned green beans, canned peas, potatoes, corn)...but I need to do better with incorporating other veggies into my diet. Last weekend Sharika (the other Heather) made some cabbage. And I ate some of it with my pork chop and it wasn't half bad! I need to maintain a focus on more good, less bad. I really thought I would be craving and missing sugar/sweets more than I have been since juicing. I am craving salty treats though...like chips, nuts, cheetos :) I am also just missing FOOD. Seriously, I can't go on Pinterest. It's dangerous. And Groupon? Hell, I bought a food groupon just the other day because I was jonesing! But I can't wait for our first meal. And what's crazy is...it's not even a binge meal I am planning in my head. I want grilled chicken breast and yes...cabbage! My FEAR is, that I am not very good at "just having one". You know, you arent supposed to say "I'm NEVER having pop (soda) again"...because you just end up thinking about and craving pop all the time...but what if I have one Pepsi and it starts a landslide? I guess I will figure it out as I go. Happy Monday. Keep fighting the good fight! Well, none of you must have been concerned that I had rode a juice truck off a bridge...because I havent received any panic emails from you, but JUST in case any of you have been staying up nights worrying about my well-being, Heather and I have made it to day 4 without killing each other or anyone else. Day one was really the toughest. Heather called my office at 11:30 am...after being awake and "juicing" for less than 5 hours and said "I can't do this". So I marched right over to HER office and told her that she can do this and that she will do this because WE AREN'T QUITTERS...and if she WANTED to quit then everyone would know it (she is such a sucker for peer pressure). She said "I haven't told anyone we are juicing", I told her "Well, I've told EVERYONE". So, she sucked it up and drank her juice (holding her nose like a big girl). Day 2 I made a juice with 3 cups of blueberries, a couple handfuls of spinach, a carrot, and a orange. That was much better. Yesterday gave birth to our favorite juice so far called Peach Pie. It called for 3 sweet potatoes, 2 golden delicious, 4 peaches and some cinnamon. Now it should be noted that I thought perhaps this was going to be DIS-GUST-ING. I mean, who wants to drink sweet potatoes?!? But guess what? It really tasted like a peach pie! I mean...minus the pie part. I almost...ALMOST snuck a couple of peanuts last night. They are taunting me from the cabinet. A sane person would throw them away. But who ever said I was sane. Our Double Bridge Run on February 2nd is fast approaching. It's 9.2 miles and I havent ran in weeks. We set out yesterday for a 6 mile run. It was sad. Both Heather and I walked at least half. My goal is to do that route 2 more times this week, improving my time each time. The thing about the run coming up is, there is a "sag wagon" that follows the slowest person and if you don't keep a 14 minute pace...they pick you up. I won't be the slowest person, but I COULD get picked up if I dont get to steady training. I hope everyone is having a beautiful weekend! For those of you who read my blog yesterday, you may remember that Heather and I were going to embark on our Juicification Tour, lasting 10 days, starting TOMORROW. As in FRIDAY. Well Heather got confused and last night thought we were starting today so I said "Why not darling?" Why not. If I would have known that we were starting today I would have at least ate a Snickers or something yesterday. There was NO TIME. NO TIME I tell you. That's rough folks. My recipe rendered close to 30 ounces...so I drank half for breakfast and I am working on the other half right now for lunch. I'm not sure if it's the kale or the cucumber...but it's tooooo earthy. Let's stop talking about it. With that said, juicing of course is not something that could or should sustain your for your life. I am hoping that after this 10 days, that juicing is something I can ADD to my diet to help me get some of the things I am missing. Anyways, I first read about Chia seeds last year in a magazine. The seeds, when mixed with water, start to expand and create a gel like substance. You can mix some seeds with a little bit of water and crushed fruit of your choice and you have jelly (almost). They have no taste or flavor and get this...they are FULL of omega-3 fatty acids (I dont eat fish and rarely get this in my diet), they expand which makes you feel full longer (so they say), they have fiber, and even some protein! You can mix them with anything. Salad dressings, juice, yogurt, cereal...they say you can even mix them with your water...I havent tried that yet. Now I can't find Chia seeds at my grocery store, Publix. But I found it at our Fresh Market grocery store and they werent that expensive. Google it. Try it. Let's start a revolution. I wonder if we can buy stock. Happy 2013 my friends! Isn't the start of a new year so damn fun? I am one of the few that probably still uses an actual pen and paper calendar for work, and there is that dreaded "in between" time when you are still using 2012 AND using 2013. Well not today folks...not today! Today there is only one planner on my desk and it's 2013. Full of so many possibilities yes? I mean, the January 1st is like the Monday of ALL Mondays...even if happened to be a Tuesday this year. You know what I mean. We are always going to be starting something on Monday. And now I bet most of us plan/planned on starting something yesterday. You may have already screwed up. And that's okay! I was going to run yesterday. So I will pretend tomorrow is January 1st. Yippeee. Like Groundhog's day. It was wonderful and free is you have streaming on Netflix. About midway through the movie, it mentioned juicing. Basically, if you aren't EATING your 7-10 servings of Fruits & Veggies a day, they recommend juicing them. Heather turned towards me and said "We need a juicer"...and turned towards Heather and said "Okay". I mean, let's be honest. I've kinda wanted a juicer my whole life...and here was my chance. Let me pause there before I get carried away about our new juicer (hold on though...it's coming). The film talk a lot about how we may be fatter than ever, but we are actually starving. Starving for nutrition. This really hit home to me because even after the lapband, I was consuming mucho less food...and yes...I did add some better choices..but for the most part, I was just eating a smaller amount of the same kinds of food as pre-surgery. For example, pre-lapband I would get a Big Mac. Post lapband, I would make my own hamburger, without a bun of course, but still smothered in cheese, mayo, ketchup...etc. 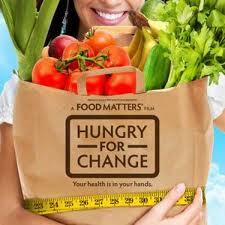 We consume so much unhealthy food that our bodies are starving for the good stuff. Too bad the good stuff sometimes taste like poo rolled in grass. So we went to Bed Bath and Beyond to get us a juicer. Now in my mind, I am thinking somewhere around the $150 price point. 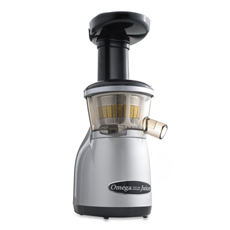 We go in, and there are some juicers around $70...and then several around $150....and then one that was $379. Well I point to the midrange and Heather points to the grand daddy ($379). Now, she was technically paying for this juicer so I was like "OKAY, let's get it!" Even though once her credit card bill comes I will be paying for it too...by listening to her complain and moan. But, we picked up the box and headed to the checkout with one of my 2,098 Bed Bath and Beyond coupons that I hoard just in case I ever need to build a hut out of them in the wilderness. After a quick stop at the grocery store, we went home to test drive our new baby. I learned several things that day about juicing. 1. It's kinda awesome. The "pulp" that comes out the other end is mesmerizing. 2. Any recipe that calls for BELL PEPPER should probably be avoided. Because it takes like you are drinking a BELL PEPPER. And mama don't play that. 3. Even though your juicing book may ASSUME you know, they should not assume. You apparently are supposed to remove the rind from the damn oranges. If you don't, the drink will taste just like you are actually eating rind. And no one likes that. 4. Carrots are a good base for all juices. I am thankful we belong to Sam's club. 5. It's kinda fun and addicting! Heather and I decided we would do a juice cleanse for 7 days. And then somehow that turned into 10 days. And ﻿I told her she couldn't do it...and she told me if I could do it, then she could do it. And then I said "Hunny...I did clear liquids for 2 weeks for surgery...I can JUICE...mmmmkay"? nothing but what comes out of our juicer. So 3 days into our juice...someone better make sure we haven't killed each other. I will be craving chocolate and nachos and she will be craving her beer. Oh it's gonna be awesome. I will OF COURSE keep you posted.